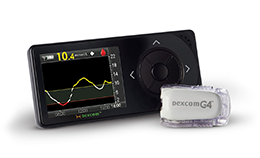 Sensor and mobile health technology, such as continuous glucose monitors (CGM), have improved greatly and healthcare providers have access to more blood glucose (BG) data than ever before (up to 288 values/day per person). In 2015, the Food and Drug Administration (FDA) approved secure remote monitoring which allows passive CGM data entry from a mobile device into the electronic health record (EHR). The new challenge is in receiving, reviewing, and recognizing patterns in the data because typical views via EHR are cumbersome and non-intuitive. In response, Stanford Children's Health created GluVue - a real-time support tool for interpreting BG data. Providers can access and review BG data nomatter where their patients are and this powerful tool is now publically available to other healthcare providers. GluVue was designed and built by Joshua Faulkenberry with clinical advisement from Rajiv B. Kumar, MD. The User acknowledges and agrees that this tool will be used only as a reference aid and that the information contained should not be used as a substitute for the exercise of professional diagnosis and treatment. In view of the possibility of human error or changes in medical science, the User should confirm the information provided through independent sources. This tool is provided without warranties of any kind, expressed or implied, and Stanford University, Lucile Packard Children's Hospital/Stanford Children's Hospital, its staff, employees and faculty disclaim any liability, loss, damages, injury or liability whatsoever suffered as a result of the User's reliance on the information contained in this tool or its content. By continuing to use this tool, the User indicated the acceptance of these terms.